Considered a Hong Kong classic, Police Story marks Jackie Chan’s initial foray into the big-time, stunt-filled action movies that become his trademark. Chan plays a honest, self-effacing cop Chan Ka-Kui assigned to protect Salina, whose key testimony could bring down drug baron Chu goes on a vendetta to frame Ka-Kui for a murder. Ka-Kui goes on the run and, with time running out, must quickly find and save Salina from being killed, as well as prove his own innocence. 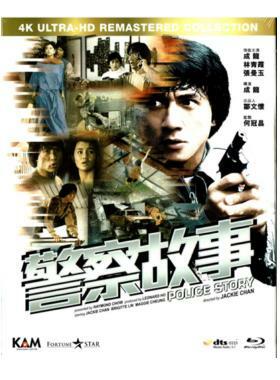 Police Story has been acclaimed for its amazing shunt works. There’s plenty of action and physical comedy. The movie shows off Chan’s generous comic persons to the fullest. For Jackie Chan fans, this is not only a must-see but also a must-have collectible.